Saturday May 19, 2001 was an exciting day - it was the culmination of the three quarter Senior Design project - ten teams racing their radio-controlled dragsters in pairs down the 100 meter path from Stocker Center to Richland Avenue. These were not regular dragsters - these were externally fired heat engine driven machines in which the entire system including the heat engine was designed and built from scratch by the teams. There was a significant amount of variation and innovation in the designs - five double-acting steam engines with spool valves, one opposed-piston wobbler steam engine, two impulse steam turbines, one gamma type Stirling engine and one Alpha type Stirling engine. Transmission mechanisms ranged from direct drive on the wheels to an air propellor drive, and one drive even included a measured fishing line giving an progressively increasing gear ratio The systems had to be completely self contained, including the water and fuel needed for the entire trip. Furthermore the dragsters needed to be remotely operated after a warmup period, including start, steering, braking and fuel shutoff. Adding to the excitement was the fact that during the Spring quarter the students challenged the professors to participate in the competition. 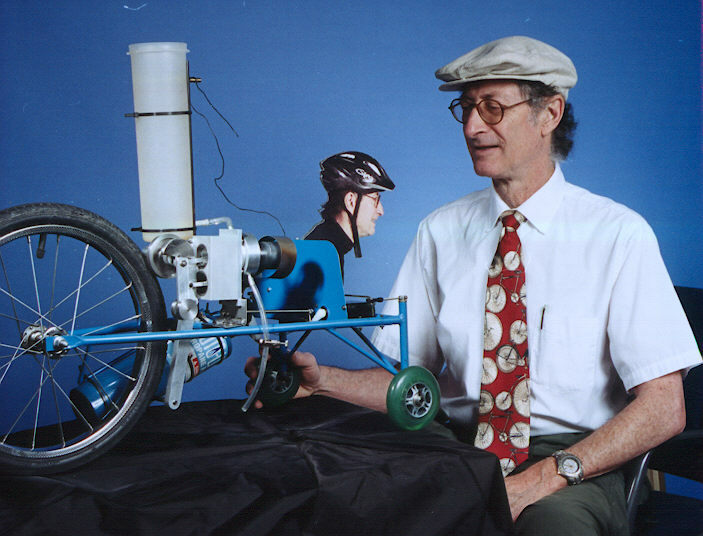 Dr. Iz accepted the challenge, and within five weeks designed and built Dizzy, a Stirling powered dragster. 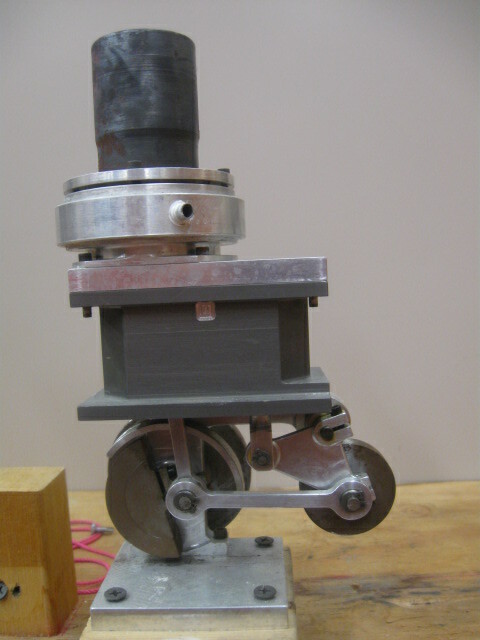 Dizzy (shown below) has a radio-controlled pivoting engine which either applies a friction drive to the wheel or a braking force against the wheel. The second channel controls the steering, as well as moving the mascot head in the opposite direction to the steering in order to confuse the competition. The engine is based on a 20 cc Rocker-V Stirling engine designed by Andy Ross. A number of these engines were built by students in the context of the Stirling engine course (refer to the learning resource: Stirling Cycle Machine Analysis). One of the student teams used one of these engines to power their propeller driven machine, however had bad luck with their butane-propane burner on race day. In the picture below we see Dr. Iz in serious conversation with the dragster a few days before the race, and the following sequence shows the Team Dizzy dragster being demonstrated on race day.